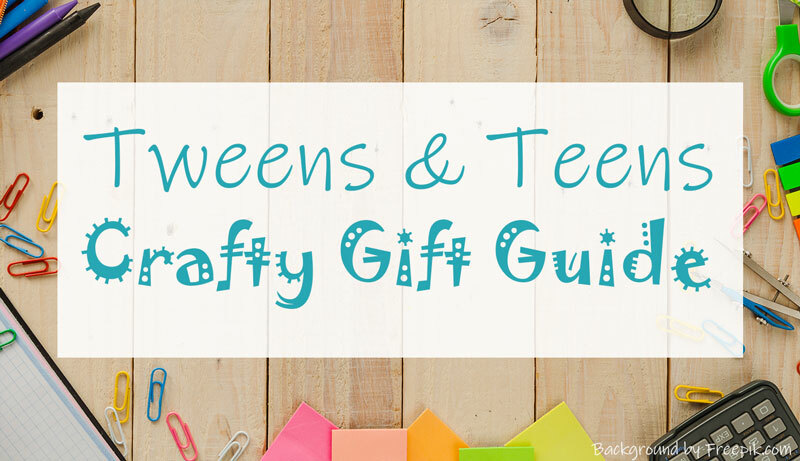 The next guide in our Complete Crafty Gift Guides for Everyone Series is for the Tweens and Teens. Around 7 years old or so, the heavenly gates of crafting start to open up with endless possibilities to master more in-depth, complex skill sets and longer term projects. I LOVE this age range because there is such a huge potential for cute, creative gifts as both individual crafts and collaborative projects to bond over. I still have vivid memories of sitting in the floor at my mom's feet, practicing my hand stitching, pulling sewing tools out of an old metal tin that was probably older than both of us combined. I have a LOT of product suggestions for this age range especially, and there is no way I can cover them all here, so be sure to check out the full list too! Sew, let's start with sewing. There are tons of really neat beginners sewing kits available for this age range, and one of my favorites is made by American Girl. The animal kits they offer are just straight up adorable, and the girls have LOVED making little baby animals to go with the mom or dad. Next up, another big favorite of mine: sewing food. I don't know why food characters are so cute, y'all. They. just. are. This Sew Mini Treats Kit is straight up adorable and sure to be loved, and The Little Monsters Kit by Craftster's is sure to be a crowd pleaser. Lastly. this Sewing Kit by Artika is BIG! 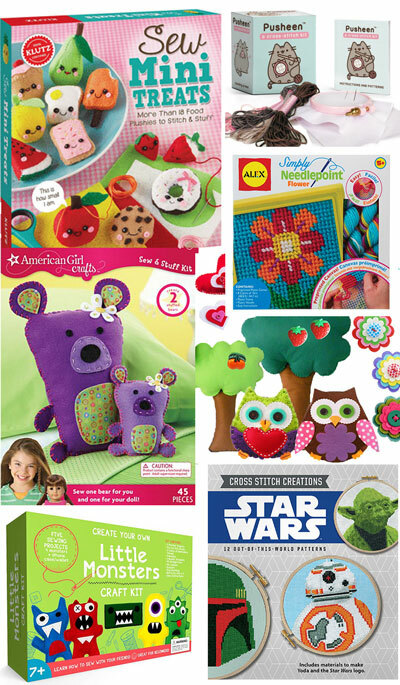 It includes everything you need to make animals, scenery, etc with felt, thread, needles, buttons, pins, stencils and more. It's a fantastic start into sewing and a great way to ease into working with patterns, which... confession time... is something I still get anxious about. Ha! While we've got the needle and thread out, this needlepoint flower is another great starter project, and this Pusheen Cross Stitch is just delightful. For those wanting a little more challenge, I have four words for you: Star Wars Cross Stitch. Have lots of fun and learn much, you will. When they are ready to put down the needle and pick up their very own machine, may I suggest the Brother XM2701? It's a great little starter machine (and also fantastic for small spaces and travel)! 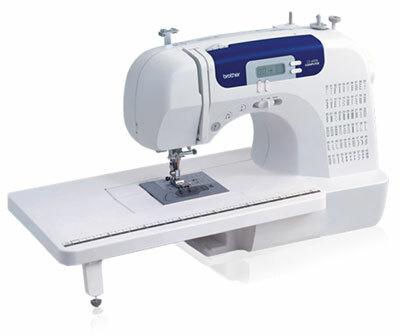 If you want a standard size machine with more stitches and an optional extension for quilting, the Brother CS6000i is a great investment. Yes, you can find cheap machines at your big box store, but just know that some of those machines are manufactured in a way to lower the price point, and yeah... you're going to see that yourself sooner than later. Though some wood crafts will still require a fair dose of adult supervision or assistance, there is a lot of fun to be had with a variety of projects at this age. Beginners projects will include larger pieces, simpler construction, and lots of fun decorating--just like this Wooden Owl Wind Chime or this Wooden Rocket Kit. There are many kits that focus a little more on construction and tool practice like DIY bird houses or race cars. And, honestly, making peg people is still one of my favorite crafts to do. 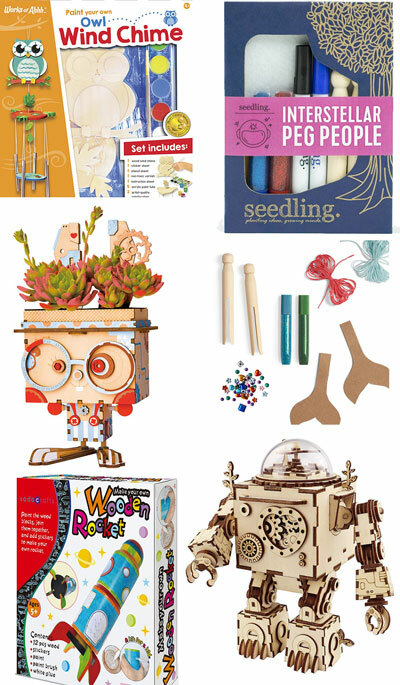 These neat little Peg People Kits by Seedling have everything you need to unleash your imagination, or you can create your own peg people party with a nice set of blanks and whatever crafting supplies you want to bring to the table. Much like the rest of us, peg people come in different shapes and sizes, and as an added bonus, I think they are super fun to sew tiny clothes for. When you are ready for some more complicated construction and creative fun, this Flower Pot comes in several designs and is guaranteed to get an instant "awwwww!" And this Robot Music Box / Wooden Puzzle is instantly impressive on a whole other level. There are a ton of different projects in their project line and they are all equally amazing. Paper crafting. There is so much, so let's just dive right in. This Ultimate Scrapbook Kit is a great all-in-one starter kit with everything you need to create a 40 page, hardback scrapbook. If you are more into folding paper than you are decorating it, this Paper Craft Dinosaurs Kit is perfect for beginners. For a more challenging project, you've got to check out The Star Wars Folded Flyers book. It comes with 40 sheets of custom designed paper, folding instructions, tape, and stands to make and display your very own Star Wars fleet. Come to the flip side and fold, Luke! For the young artist in your life, I present to you the The Super Hero Comic Kit. It's the perfect canvas for that budding illustrator / writer. Ready to roll? The World of Paper Quilling offers tons of supplies to get you started. It is amazing the kinds of things that you can make with just a tiny roll of paper. Tip: create your own quilling strips together with the hand crank paper shredder! We love ours. And make sure you save all your scraps to create custom recycled paper beads for your next project. It's the ciirrrcclllleee of crrrraaafffttt. And so we continue on to the wonderful world of clay. But we are way beyond your little sister/brother's play doh, folks. You've now hit the perfect age for their very own pottery wheel and first experiences throwing clay. 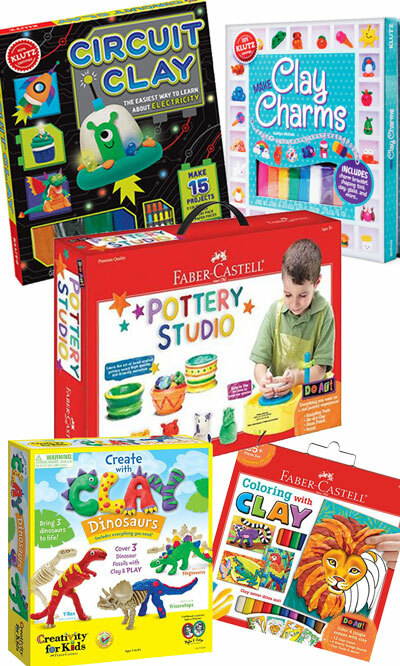 This Pottery Studio by Faber-Castell has everything they need to get started--it even includes an apron and a table cover (parents everyone rejoice!). If you're more into scuplting, Circuit Clay by Klutz is a full kit complete with circuits, LEDs, and battery packs to make your creations light up. Art and science, ftw! Featuring one of my favorite combos, Clay Charms is a kit that will teach you how to make a number of clay minis including... (drum roll) tiny adorable food! And lastly, this Clay Dinosaurs Kit is the backbone of clay dinosaurs... literally. This kit allows you to bring dinosaur fossils to life by covering them with your own creativity and clay. Admittedly, I have never seen someone Do Art Coloring with Clay, but this kit makes it look like so much fun! It includes 4 design boards, soft clay that won't dry out, and easel backs to display your hand work. Ugh, y'all, there is just SO much I want to show you and talk about for this age group, but I'm running out of space and time! We haven't even touched on the other fiber arts, slime making, string art, general arts and craft kits and supplies, sand art, jewelry... the list goes on and on, but I have included it ALL on my FULL Tweens and Teens List on Amazon, so please check it out! I'll be updating it with even more ideas as we go! I tried to cover a full range of more involved crafting here, but be sure to check out the Kids and/or Young Adult + guides if you feel like your skill sets didn’t quite match up. There are a lot of similar projects sorted per skill level in both guides so you can keep encouraging creativity and healthy challenge! 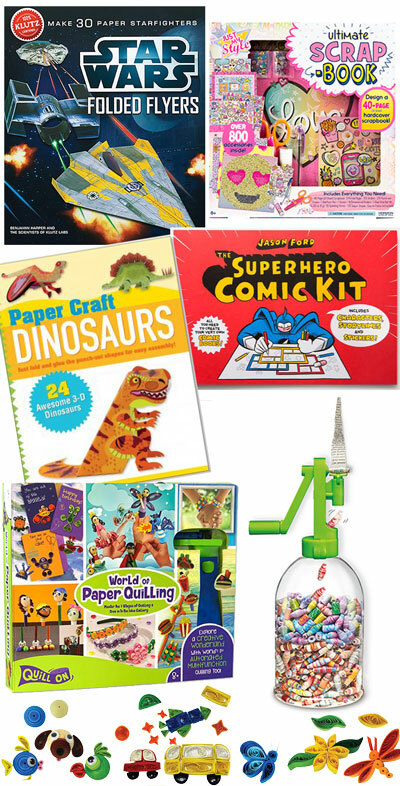 There's also a great Books for Crafting and Creativity List to supplement your craft gift with.